Saturday’s meeting was well attended and went quite well. There were two County Council representatives, one County Commissioner and four Culver Town Council Members. There were also three members of the Culver Redevelopment Commission there. All of them were in with a mix of citizens from Culver and Union Township. All told, there were 30+ in attendance. Jerry Chavez, President of the Marshall County Economic Development Corporation (MCEDC) lead a group discussion on the needs of the County, both in the area of Economic Development and the deterioration of County Roads. Handouts were provided showing the an increase in paving costs of 98% since 2003 while highway funds have actually decreased. The Local Option Highway User Tax (LOHUT) was discussed. Chavez said, “The State is giving us the tools to handle our problems ourselves. We need to use them.” He also noted that the State was considering matching County LOHUT funds… meaning if we don’t have the LOHUT in place, we will not get that funding. Easterday Construction has been a member of the National Federation of Independent Business (NFIB) for decades. We continue to support their efforts to support small business. 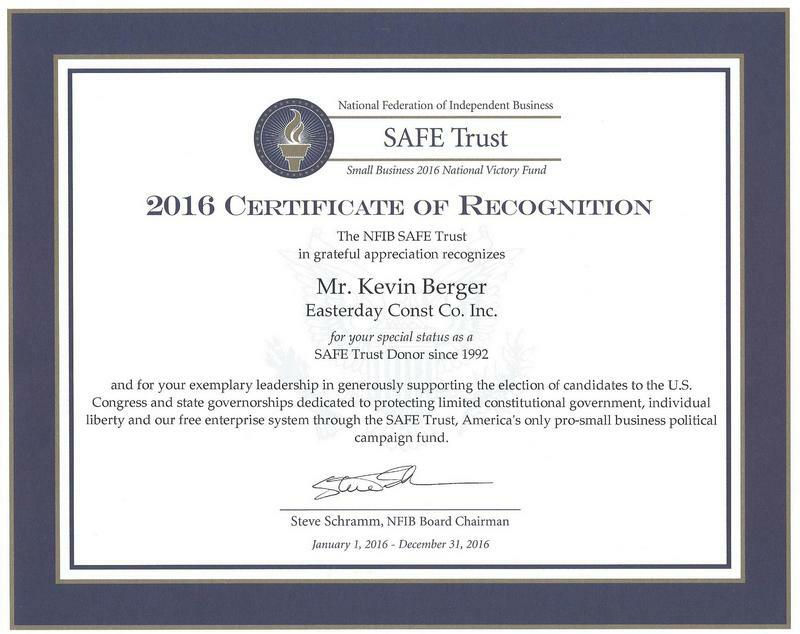 Through the SAFE Trust, we are pleased to support those political candidates that support small business. Last week MCEDC had a Marshall County Vision Meeting in Culver with a select group of Culver representatives. Those representatives helped refine the message and selected a date for a Town-wide meeting. MCEDC hopes those representatives will also help get the word out to assure a good turn out. The message we’re sharing is a call to action. The more people that hear this directly from the source, the more clearly the message will be recommunicated. Invite you friends and neighbors. This is important to us all. Thank you to Rich West and the Culver Cove for hosting! I wrote about my distaste for the State of the Union address last year at this time in a post here. This year is shaping up to be no less the embarrassing spectacle. Listening to the Sunday morning news shows yesterday, I heard that President Obama is planning to leave two seats empty, to which I say, “Good Start!” Maybe if they were all empty this sham would be recognized for what it is and it would be the last one we had to endure. The quote to the right is from an article by Kevin D. Williamson, written for the National Review, titled Great Caesar’s Ghost. If you’re interested in reading it, I’ve linked it here. It’s a couple of years old, but still worthwhile.